producing sliding mirrors for your comfort. Miior is an award-winning Polish company who has been producing innovative mirror designs for nearly a decade. We manufacture premium quality products using our own technical solutions, such as our patented hinge mechanism and “active” anti-fog system that uses an internal heating pad to keep the mirror’s surface crystal clear, even in bathrooms or other high moisture environments. Our space-saving pullout mirror sits flush with the wall when not in use. You simply pull it out for comfortable, properly angled, perfectly lighted, close-up use. This comfortable feature is particularly popular with older users, persons with limited mobility, and for our customer who wear glasses. 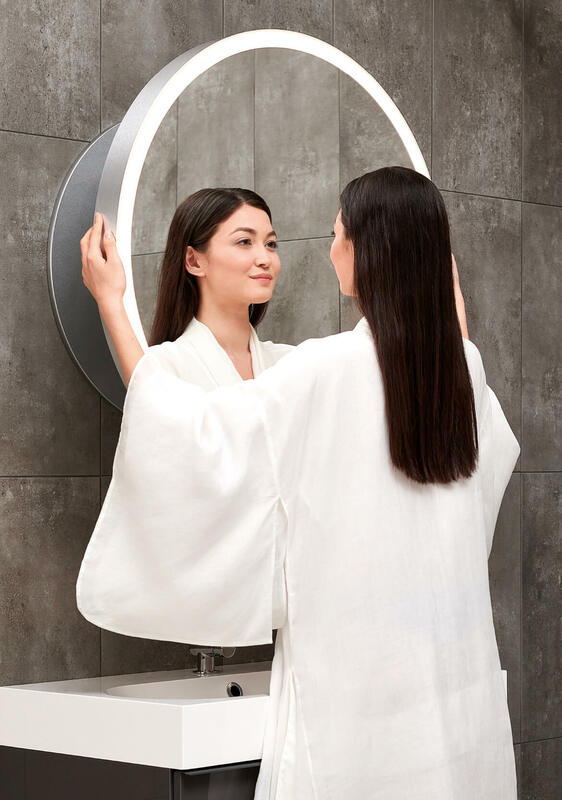 An integrated LED lighting system silently switches on when the mirror is pulled out and switches off when returned to the wall A simple and intuitive design that delivers a perfectly placed light source, free of shadows, dark spots, or glare. That means better color balance when applying make-up, or a closer, faster shave without nicks and cuts. Our mirrors have won many international awards for their innovative design, functionality and modernity. That’s why ours is the product of choice for some of the best known luxury hotels, such as the Morpheus Hotel in Macao, designed by Zaha Hadid Architects. We also offer a variety of formats, colors, and materials, so you can be sure to find a model that integrates seamlessly into any bathroom or beauty corner, both in private homes and in public places. Moreover, our commitment to research and innovation means that each new generation of mirrors offer ever improved features, such as a super-thin profile of just 3,5 cm and a choice of color temperatures. Our popular built-in mirrors are designed for easy installation, mounting flush with the wall and offering a neutral look that blends in with any décor. Miior mirrors also meet rigorous safety standards, so they are a safe choice for use in bathrooms. Because all of our mirrors are produced in Poland by a highly qualified factory team, you can be sure you’re getting the highest standard of materials and workmanship in every product we sell. Our website provides instructions to help with mounting and configuration for most models and our consultants are available to assist in choosing the right model for your needs. We invite you to check our website to find a local Miior dealer. Welcome to the world of Miior!